Marli is a contract manufacturer/warehouse distributor that focuses on specific application automotive fasteners for the aftermarket. Our forte is specialty threaded devices. An expansion outside of automotive fasteners was begun in 2006. Fasteners are sourced from original equipment manufacturers. 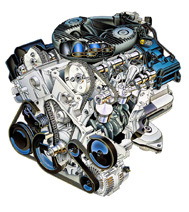 Inventory is maintained for immediate shipment to other distributors or production engine rebuilders. Difficult to find fasteners, specials, specialty threaded devices, and related items not in our line may be sourced for customer needs.